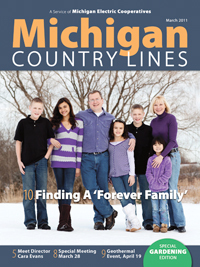 Country Lines covers energy, lifestyle and rural issues of interest to member-owners of Michigan’s electric cooperatives. Published monthly, except August and December, it promotes strong reader identification by publishing reader letters, essays and recipes. Subscribing cooperatives have the option of using up to eight pages for local news and features.